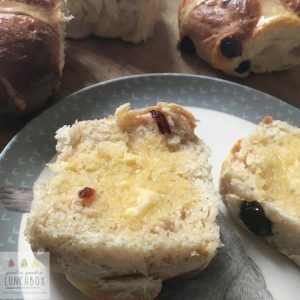 OK so right now I am drinking my morning coffee and waiting, rather impatiently, for a batch of these delicious Berry and Cardamom Hot Cross Buns to bake. These are the benefits of waking at 4.45am on a Saturday. At least it means I can have fresh Hot Cross Buns for breakfast! 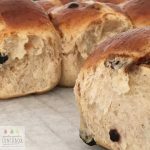 Have you ever tried making hot cross buns from scratch before? I promise you once you do you will find it hard to eat store brought ones again. There is nothing that beats the smell and taste of freshly baked hot cross buns. And this recipe for Berry and Cardamom Hot Cross Buns is a good one. Deliciously spiced and low in sugar the flavours are a gorgeous alternative to the traditional buns. Have you baked with yeast before? If you haven’t, or have but to little success, do not fret! These are really quite easy to make. And I find the more you make dough the more you get the feel for when you have kneaded enough. I love to get the kids helping me with the dough. They love getting their hands dirty and it doesn’t matter so much about over-mixing so I can let them have more free reign! In a small jug mix together the self raising flour with 1/4 cup of warm water and mix together. Pour into a small ziplock bag and carefully cut a hole in one of the bottom corners of the bag. Use this to pipe the crosses onto the bun. It is easiest to pipe in long lines across all the buns in the row. I make mine quite low in fruit and this is totally just personal preference, you could add another cup of dried fruit to this recipe. 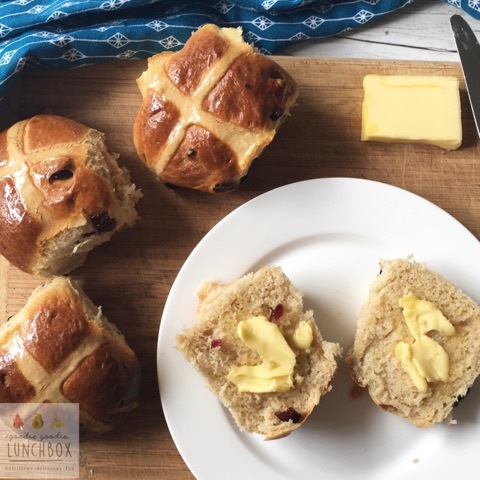 I hope you enjoy these delicious Berry and Cardamom Hot Cross Buns as much as we do! If you are looking for some other Easter recipes you could always make these delicious Carrot Oat Cookies for the Easter Bunny! Thank you – they taste delish! Looking forward to eating them tomorrow! What sort of yeast do you use please? I normally buy the active dry yeast (Tandaco) so 2.5 tsp sounds like quite a lot!